Gender bias is a big issue in today’s society. 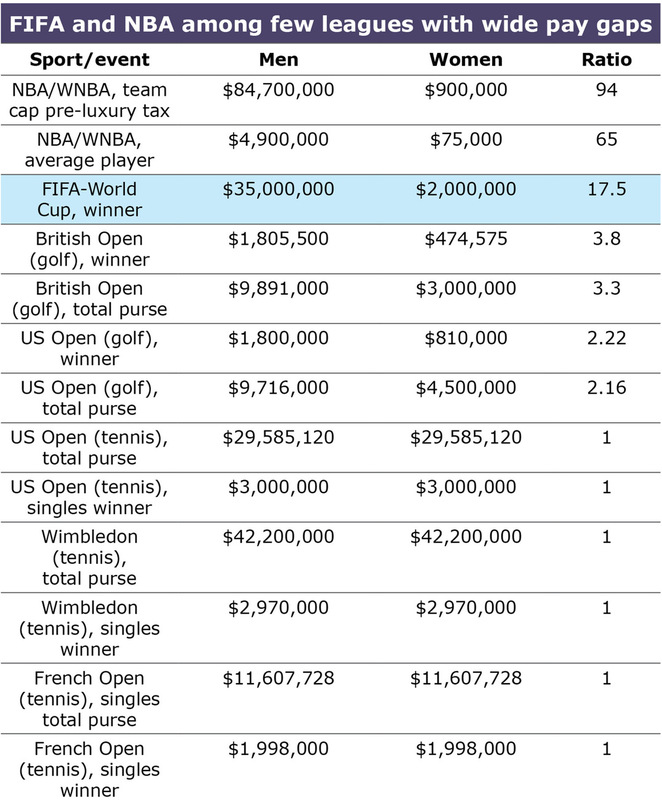 In sports it is clear to see that men get more attention than women, especially when it comes to pay disparity. From my viewpoint, two sports stand out. One of my favorite movies is “Dare to Dream.” It is a documentary that was made in 2005 about the women’s soccer team. It talks about their journey from the very beginning and how much hard work it took to get to the top. This movie highlights some influential players who were with this team from the beginning such as, Mia Hamm, Julie Foudy, Kristine Lilly, and Joy Fawcett. The movie shows the ups and down and how hard it was to make it as a professional women’s soccer team. The women’s team has definitely come a long way, but an issue the team is still struggling with today is pay disparity. According to the New York Times, "five top players on the women’s team accused U.S. Soccer of paying them and their teammates about a quarter of what their counterparts on the men’s national team receive." The women came very prepared with their issue. They explained that they had been very successful and produced millions of dollars in revenue for the U.S. Soccer in the year 2015. They were also very confident that they could produce the same results for the 2016 season. The women brought in over 23 million dollars, which is 16 million more than was expected. The New York Times says, "After expenses, the women turned a profit of $6.6 million last year. The men? Their profit was just under $2 million." Even after all of this the men still get paid more. Women’s basketball has the same issue. According to Vice Sports, "The difference between what men and women are paid for essentially the same job is referred to as the gender wage gap. A woman is paid 78 cents for every dollar paid to a man doing the same work." To do the same job as a NBA player, it is unfair that the women are paid a lot less than the men. Why should the men’s team be paid more? If the answer is because he’s a man, that is unacceptable. The WNBA is only getting paid about 33% of the team’s revenue which is a lower number than the NBA’s 50 percent. Vice sports gave a very good example to show how much the women in the WNBA make. "If the WNBA paid 50 percent of its revenues to its players, the average player–given the above estimates for the WNBA—would receive $114,249, which is more than the current league maximum." Their pay is very low compared to NBA players. According to moneynation.com the typical NBA player makes 2.5 million a year. Players like Kobe Bryant and LeBron James make over 25 million dollars a year. The minimum pay for a NBA player is $525,093, which is the player that doesn’t typically play. My first question when I read this was how could the person that just sits on the bench make more that the female basketball player that is a starter and plays all the time. Pay disparity is an issue that cannot be resolved overnight, but can be discussed over time to make things fair. To play the same game and do all the hard work to get there is definitely not shown in the women’s paycheck as it is shown in the men’s. Just because a player is a female doesn’t change the price of the mortgage or the light bill the woman has to pay. They have to live as well. Women can definitely live off their salaries, but to do the same job as the men, they should be paid more. Gender should not determine how much someone gets paid, only talent.